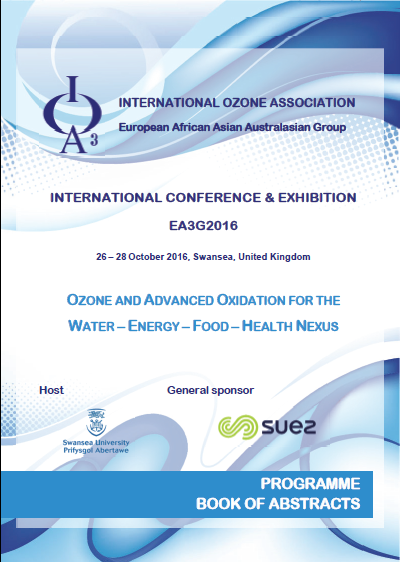 IOA 22nd Ozone World Congress & Exhibition, on Ozone and Advanced Oxidation Leading-edge science and technologies. June 28th - July 3rd, 2015, Barcelona, Spain. IOA-EA3G International Conference Ozone and Related Oxidants for Water Treatment, Food Processing, Agriculture, Industry, Health and Environment. June 3-5, 2014, in Dublin, Ireland. - Taicang No.3 water treatment plant. Jiangsu Province. To order, please download this Order Form. International specialised symposium - " fundamental and engineering concepts for ozone reactor design "
Contains 58 papers covering Ozone Applications (in Drinking Water Treatment, Cooling Water Treatments, Wastewater Processes and other fields), Advanced Oxidation Processes, Reaction Mechanisms - Ozonation Contactors, Ozonation Contactors - Bromate Formation. Contains 44 papers covering ozone generation and related topic, Ozone Mass transfer and modelling, Ozonation in drinking water treatment, Ozone in Waste Water Treatment and related, Ozone chemistry in aqueous systems, and a Forum presentation.